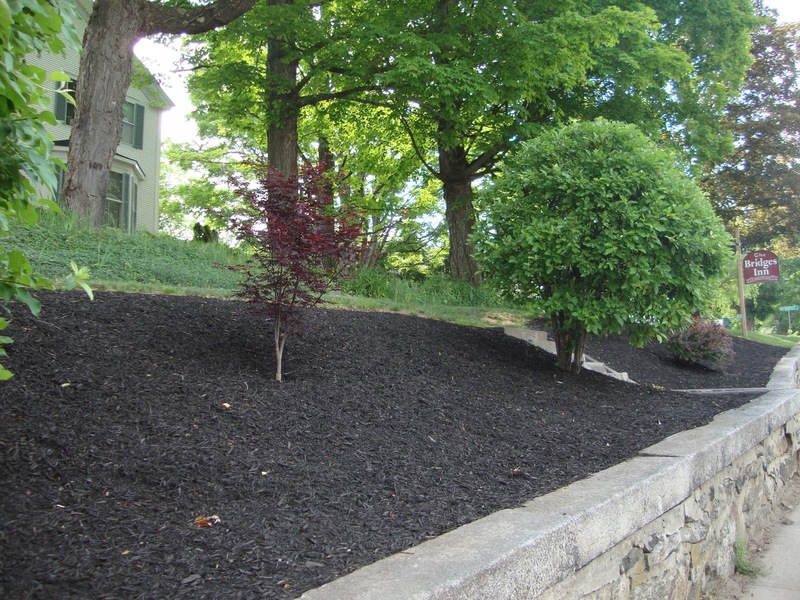 Summer of 2015 has been filled with landscaping projects at the Bridges Inn at Whitcomb House. 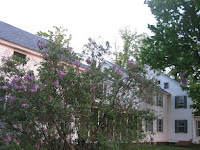 We began last year with pruning the large maple trees and many of the large shrubs on the perimeter of the property. Today, August 13, we added a new bird house -- it's actually an owlhouse! And not exactly considered landscaping, but part of the property improvement project, is a new American flag. It wasn't intentional but the owlhouse and the flag match! 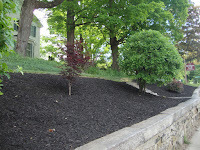 This year, we cleared out the pathways and brought in pine bark mulch on the east side of the house near the gazebo. We planted many new flowers. An abundance of flowering plants are in bloom now, such as black-eyed Susans, many types of lilies, pansies, hydrangeas, roses, phlox, lucifers, and Shasta daisies. We continued work along the front, Main Street edge of the property. We pulled out overgrown shrubs and plants and planted some dogwoods and small maple trees. We filled in much of the area with pine bark mulch. Perhaps our biggest accomplishment was to remove the old, uneven granite steps that went to the front of the inn (which no one used). This required work on the old stone wall to make it continuous, closing the opening to Main Street. Masonry work on the stone wall will be done in the near future. Meanwhile, there's ongoing upkeep, such as mowing the lawn, watering the plants, and weeding. And David takes care of all the upkeep (shown weeding below)! We love the sunflowers that he planted and have sprouted around the yard! Shown below are flowering plants and bushes from earlier in the season. 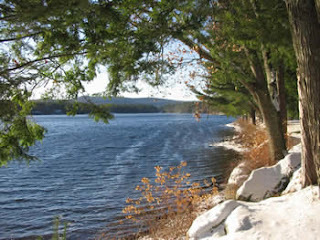 If you're looking to cool off or have some fun at the beach without having to drive very far, take advantage of the lakes and ponds in the Monadnock region. The closest to the Bridges Inn, and our personal favorite, is Richardson Park, on Swanzey Lake. Open from Memorial Day through Labor Day, daily, 10 a.m. to 8 p.m. It's a shady beach with a nice view and water quality is generally considered good. There's no charge to get in and plenty of parking. Shown below, Richardson Park is for Swanzey residents only, including guests of the Bridges Inn. Otter Brook Lake Recreation Area in Keene and Roxbury and Surry Mountain Lake Recreation Area in Surry (shown below) are operated by the Army Corps of Engineers. Both are picturesque, family-friendly places for swimming, picnicking, and canoeing. There's a sandy beach, roped-off swimming area and plenty of grassy areas to set up games throughout each park. There are also picnic tables and rest rooms. On Spofford Lake in Chesterfield is Wares Grove is on Route 9A. The water is shallow for a long way out and is great for young children. The large sandy beach has a grassy area in the shade with picnic tables, a concession stand and a volleyball court, basketball, tetherball, and a swing set. There are bathrooms and grills. There are resident and non-resident fees. For more information about swimming holes in the Monadnock region, click here. In addition to directing Bridges Inn guests to places to swim, we can help you plan other activities to fit your particular interests.